With its stable and reliable technology, comprehensive security management functions and a rich ecosystem, AWS allows us to focus on our core businesses, achieve rapid product launch and iteration, and offer our customers stable, reliable and personalized online learning services. Liulishuo is an AI-driven education technology company that promotes “AI + education”. Established in September 2012 by the “The Recruitment Program of Global Experts” experts Yi Wang, Ben Hu and Lin Hui, Liulishuo boasts a superior AI team that has independently developed the AI English Teacher to provide each user with personalized and adaptive courses based on deep learning, thus significantly boosting learning efficiency. Based on a large-scale “English pronunciation database of Chinese learners” built over the years, Liulishuo has developed cutting-edge English speaking assessment, English writing scoring engine and deep self-adaptive learning systems to help users improve their English proficiency in all aspects including listening, speaking, reading and writing, providng them comprehensive and systematic solutions for English learning. By July 2018, the Company’s flagship app “English Liulishuo” had more than 70 million registered users including over one million paid users from 175 countries, including 379 cities in China. As a widely popular English learning app and a vibrant language learning community in China, it is rated by Apple as one of the “App Store Essentials” and “Best Apps of the Year”. Liulishuo is among the first online education companies in China that achieved significant profits. In July 2017, Liulishuo completed the Series C financing of approximately 100 million US dollars. In its various financing series, the Company has been invested by: IDG, Trustbridge Partners, GGV, China Media Capital (CMC), Cherubic Ventures, Wu Capital, Hearst Ventures, among other well-known VCs. At the early stage, Liulishuo employed a combination of On-Premise and public cloud platform to launch its first product “English Liulishuo” app on February 14, 2013. This product features integrated core technologies such as voice recognition, scoring engine and self-adaptive learning. In addition to situational dialogues, dubbing show, pronunciation courses and other diverse contents, it also features AI English Teachers and gamified learning like role-playing, scoring and stage clearing to inject an element of fun into user experience. Gaining instant recognition from users, this fun and effective product hit the million-user mark within the year, and managed to multiply the number by ten shortly after. Based on big data and artificial intelligence, Liulishuo’s flagship app “English Liulishuo” is an English learning product for adults. Security, stability and scalability were Liulishuo’s main considerations in selecting the cloud platform. With its stable and reliable technology, comprehensive security management functions and a rich ecosystem for tech development, AWS became the ultimate choice for Liulishuo. Stability and reliability of AWS are determined by the stability of its various functional products and its overall technical architecture. AWS products used by Liulishuo mainly involves computing, storage and data analysis functions. Regarding computing, AWS provides a series of coordinated functions, including Amazon Elastic Compute Cloud (Amazon EC2), Amazon Elastic Container Registry (Amazon ECR), AWS Lambda, AWS Auto Scaling and Elastic Load Balancing. In coordination, these functions not only provide adjustable computing capacity that allows users to control required computer resources, expand or reduce computing capacity when computing requirements change, but also automatically detect unhealthy instances and reroute traffic to healthy ones until the unhealthy instances have been restored. This will provide greater application tolerance. Regarding storage, Amazon Simple Storage Service (Amazon S3) stores data in multiple facilities and multiple devices within the same facility with redundancy, so as to provide users with 99.999999999% data persistence. In addition, Amazon Glacier and AWS Storage Gateway allow users to safely and seamlessly integrate local storage with AWS storage, and safely and reliably store mass data at lower cost. “With its all-round stability, AWS allows our development team to focus on product R&D without worrying about any problems of basic architecture”, said Ben Hu. Liulishuo boasts a massive “English pronunciation database of Chinese learners” as its core asset. With growing data volume, the importance of AWS secure data management stood out. With rapid business expansion and growing product portfolio, Liulishuo needs to conduct cluster isolation and divide different businesses while optimising resources. “Amazon Virtual Private Cloud (Amazon VPC), AWS Identity and Access Management (IAM) and other security management functions provide us with convenient ways to achieve security management objectives”, said Ben Hu. Amazon VPC allows users to preconfigure multiple virtual network environments in AWS and place different businesses under different virtual networks. For instance, with Amazon VPC, it is possible to create a public subnet for an application system accessed by users at the front end, while placing back-end systems such as database and application server in a private subnet that cannot access the Internet, and use IAM to create and manage AWS users and groups to achieve secure management of the entire system through various security layers such as security group and access control list. “As a start-up, Liulishuo must focus on its core businesses. If there are open-source tools that can address our needs, open source will definitely be our first choice. For open-source or closed-source products, when it comes to integration with public cloud platform, AWS is a natural choice wherever we are in the world. The rich ecosystem makes it easy for us to select application system based on specific needs and cut down on labor cost. For instance, we use open-source tool Terraform to manage resources, and the cloud platforms it supports includes AWS”, said Ben Hu. Apart from a technically rich ecosystem, AWS also has varied online and off-line trainings and user and developer activities, which gather the best developers and industry users around the world and provide opportunities for them to share their success stories. In September 2014, Liulishuo migrated its entire system to AWS, including Liulishuo’s official website, data analysis platform, payment process, business applications, among other systems, maintaining secure and stable operation throughout the process. 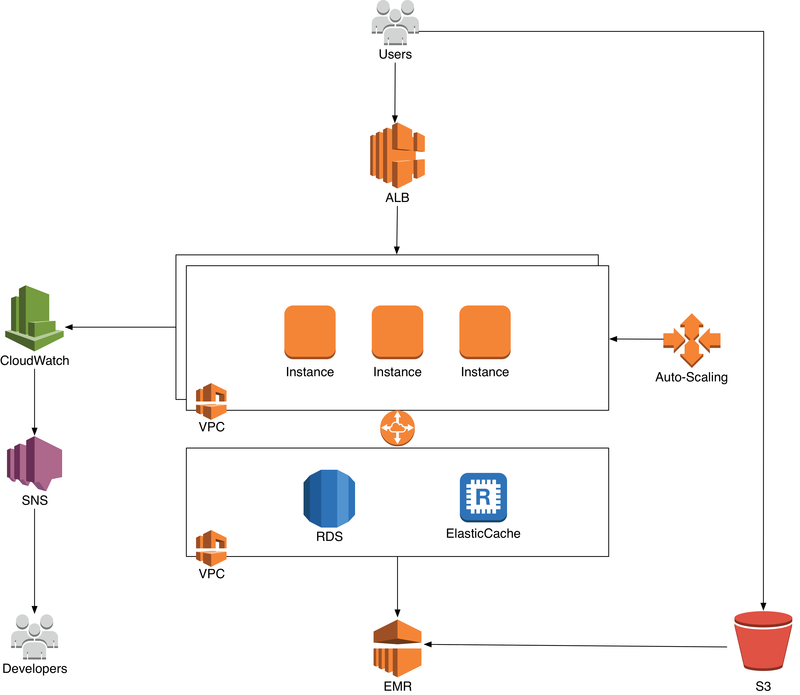 Currently, AWS services employed by Liulishuo include Amazon EC2, Amazon S3, Amazon Relational Database Service (Amazon RDS), Amazon ElastiCache, AWS Support, Amazon Elastic Block Store, Amazon CloudWatch, AWS Data Transfer, Amazon EMR, Amazon DynamoDB, AWS Config, AWS Storage Gateway, Amazon Route 53, AWS CloudTrail, Amazon Simple Queue Service and Amazon Simple Notification Service. Figure 1 shows Liulishuo’s system architecture based on AWS. AWS deployment has benefited Liulishuo in two aspects: First, it has led to a remarkable improvement in overall system stability, with the availability of applications reaching 99.9%. Liulishuo’s business development exhibits two features: Rapid growth in the number of users: it took only four years for its users to increase from one million to 70 million; Uneven distribution of user traffic over 24 hours each day: the peak-hour surge in traffic at noon and after six p.m. is 10 times higher than during off-peak hours. AWS automatic O&M function allows Liulishuo’s entire system to cope with changes in traffic with ease, so as to provide users with stable and reliable access services and better user experience. Secondly, it saves both resources and manpower. In terms of resource allocation, AWS-provided functions such as AWS Auto Scaling and Amazon EC2 Spot instance have substantially reduced resource occupation cost. After Amazon EMR’s deployment, in particular, data processing speed and volume have substantially increased while low-cost instances for data processing at night effectively reduced cost. In terms of labor cost, AWS automatic management function has reduced the demand for system O&M, saving the cost of full-time O&M personnel. Striving to improve itself as an AI-driven education technology company, Liulishuo plans to adopt more AWS products in the future, including Amazon Machine Learning and GPU instance cluster to increase data analysis speed and accelerate model training iteration that deliver better personalized learning experience to its users. To learn more about how AWS can help education customers, visit Cloud Computing for Education page. To learn more about how AWS can help you meet big data needs, visit our Big Data details page.